Yumi has always been that clothing brand with flare. Born in Camden, more than 18 years ago, women always look to Yumi apparel for a splash of colour and a little twist. Where does the love for Yumi lie? In the prints of course! Renowned for it’s fried eggs (at the start), and now on to florals galore, owls, the perfect stripes and many more an eccentric detail, if you can’t quite pin your style down, you’ll love the diverse range of Yumi clothing. From every type of dress you could envisage, the tea dress, tunic, a lacey number or that work winner, to everyday knitwear, denim and more - you can shop your casual cardigans alongside snazzy jumpsuits and nightwear - Yumi collections call for every occasion. With statement and everyday pieces featuring hints of Japanese and more worldly influences - Yumi is famed for its unique clothing and you can even witness this stand out style in accessories and homeware too. Check out the Yumi Journal to see the latest on the ranges and for heaps of kitsch lifestyle talk too. With new additions to discover all year long, with Yumi you’ll be investing in sunny looks that will add delight to your wardrobe and every day too. How do I use my Yumi promo code? Choose an offer and copy your promo code. 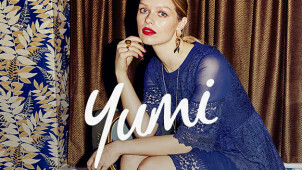 Click ‘Shop now’ to go to yumi.co.uk. Select from the options available in the styles you’d like and add them to your virtual bag. Proceed to checkout when you’re ready. Click ‘Promo/Gift Certificate’ to enter your promo in the space provided and click ‘Apply’ to receive the discount. Without a code, deals will be automatic when you’ve shopped items that qualify for a discount. Signing up with your email to Yumi will get you money off your first order, as well as free delivery! When is the Yumi sale? You can shop the clearance pages at Yumi for money off plenty of styles for women and girls too. Is there a Yumi size guide? You’ll be able to find a size guide on each product page to ensure that you order the right clothing for you from Yumi. Can I track my Yumi order? Returns are free so long as items are returned in their original condition and within 14 days of their delivery date. If you’re a fan of feminine yet trend inspired clothes, then Yumi is for you. Yumi designs fabulous fashion for looks that can take you from day to night with ease. Keep costs at bay with a Yumi discount code and discover trends with a twist. Founded in Camden over 18 years ago, Yumi has come a long way in its fashion development so shop the Yumi collections for lovely things that will catch your eye. Yumi has something to suit every figure. If you are a plus sized lady, Yumi Curves has you covered. With sizes ranging from 18 to 26, find items for every possibility, from trendy work looks to sophisticated evening outfits. Shop the selection of prints and quirky patterns to find your perfect, tailor made plus size item. Let Yumi Curves be the go-to for any occasion! At Yumi, dresses are ‘their thing’. With a vast selection of dresses ranging from party dresses, summer dresses or the classic LBD, you are sure to find what you are looking for. Whether you are searching for a girly day dress, or elegant evening attire, grab a Yumi voucher code and get the perfect look for less. Be prepared for the compliments!